Historically, agriculture has played a very important role in the fertile crescent between the Tigris and Euphrates rivers. Today, after several years of ongoing conflicts in Iraq and Syria, agriculture and the livelihoods that depend on it have suffered massive loss in this area. The fighting is not only putting civilian lives in danger, but also jeopardizing the agricultural production in the region. Several families dedicated to rural farming and herding have been forced to migrate or look for other sources of income. Moreover, vast areas of agricultural land, resources and infrastructures have been destroyed. The most affected regions in these countries are the Nineveh, Kirkuk and Salahuddin governorates in Iraq and Al-Hassakah, Ar-Raqqa, Rural Damascus, Deir-ez-Zor, Dara’a and Idleb in Syria. This image, captured by Deimos-1, shows part of Al-Hassakah, in Syria, and Nineveh, in Iraq, two of the main agricultural regions in this area. Vegetation appears red in this false-color image that was processed including the near-infrared channel. Different shades of red provide crucial information on chlorophyll content and plant health. This other image, captured by Deimos-2, shows a smaller part of the same region in true-color and very-high resolution. According to a recently released research carried by the Food and Agriculture Organization of the United Nations (FAO), food production is at a record low in Syria and around half the population remaining in this country are unable to meet their daily food needs. In spite of the crisis, agriculture remains a stronghold for the country’s economy, accounting for around 26 % of the gross domestic product (GDP). However, FAO reported loses of around USD 16 billion in terms of production, along with damaged and destroyed assets and infrastructures within the agriculture sector. In Iraq, after a period of stagnation in the 1990s, agriculture rapidly declined. Iraq’s oil-driven economic growth resulted in the neglection of the agricultural sector, in low investment levels and in rural populations leaving farms to move into urban areas. In addition, the conflict with ISIS and their scorched-earth strategy is estimated to have reduced Iraq’s production capacity by at least 40%, according to the Jordan-based organization Regional Food Security Analysis Network. Agriculture is not only an important source of income that benefits poor population, reduces the need of humanitarian assistance and stems migration, but also a key element for political legitimacy by ensuring food provision to the broader population. Thus, agricultural development efforts will be key to rehabilitate livelihoods and prevent a return to radicalization and conflicts. Investment in technology will be crucial to modernize and implement productive agricultural techniques. Geospatial information and imagery are an easy-to-use and cost-effective tool to improve the efficiency of cultivation practices and to apply precision agriculture. For instance, the satellites Deimos-1 and Deimos-2 that captured the images above can be used in a variety of agriculture applications such as drought assessment, in season monitoring, crop management, and grazing management. 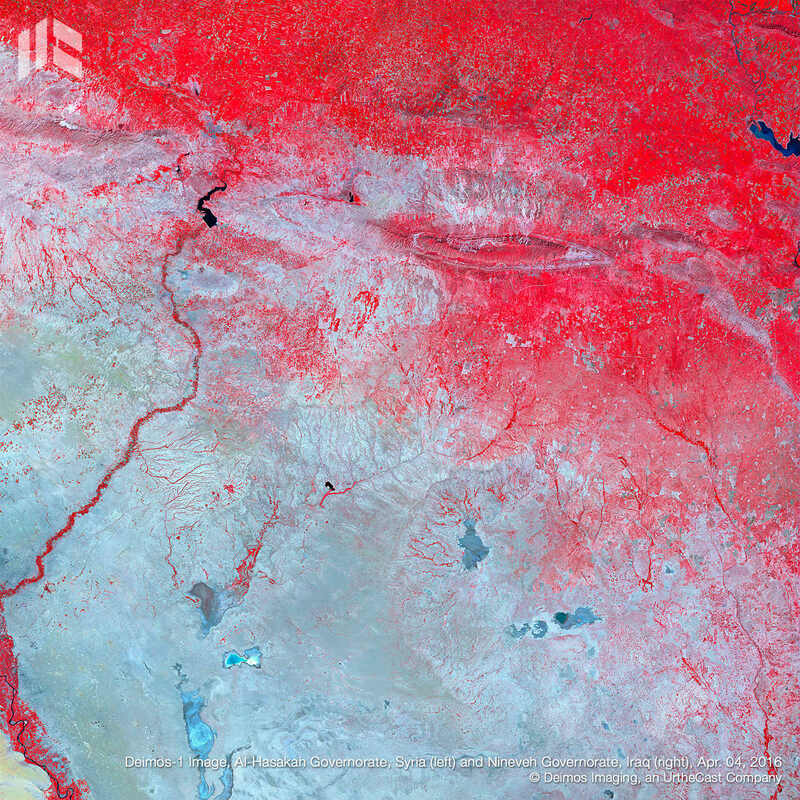 Deimos Imaging, owner and operator of these satellites, can directly provide value added agriculture services to customers, or rely on its global network of partners who can offer a wide portfolio of tailored services. Launched in 2009, Deimos-1 was designed especially for agriculture applications and it has quickly become one of the leading sources in these kind of services worldwide. 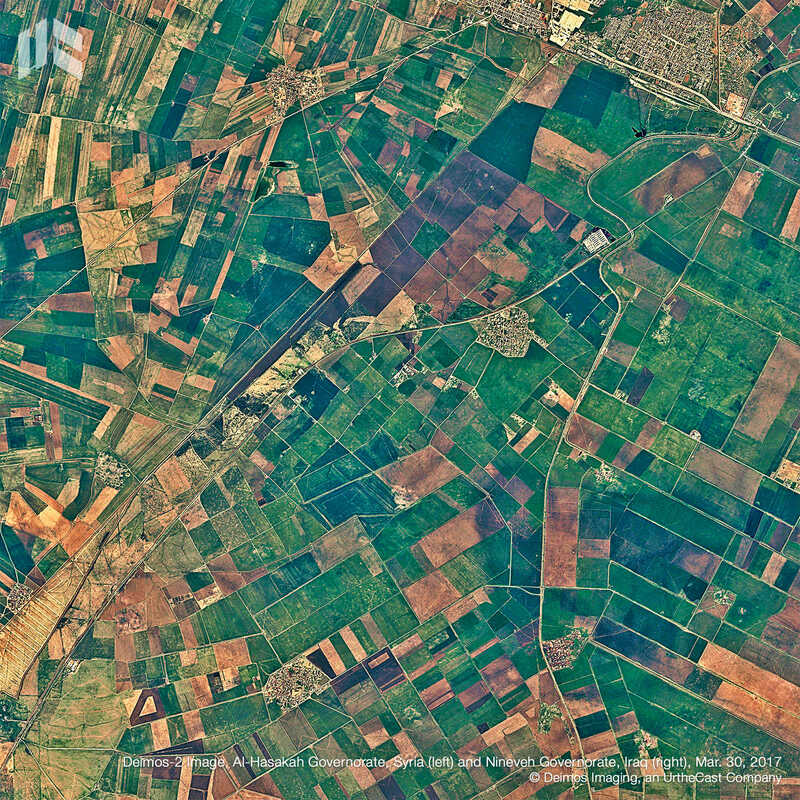 Meanwhile, Deimos-2, launched in 2014, provides imagery with a much higher resolution – 75 cm/pixel – that also present a powerful and affordable solution for precision agriculture services. As a natural evolution from Deimos-1 and given the importance of satellite imagery in the farming industry, UrtheCast Corp. is developing a new constellation specially tailored for precision agriculture and monitoring purposes: UrtheDaily™. This planned constellation will provide high-quality, multispectral optical imagery of the Earth’s entire landmass (excluding Antarctica) every day, at the same time, from the same altitude. With its exceptional capabilities, it will present a disruptive and problem-solving technology that can foster sustainable development, not only in Iraq and Syria, but worldwide. UrtheCast Corp. is a Vancouver-based technology company that serves the rapidly evolving geospatial and geoanalytics markets with a wide range of information-rich products and services. The Company operates Earth Observation (EO) sensors in space, including two satellites, Deimos-1 and Deimos-2, to produce imagery data that is displayed on UrtheCast’s cloud-based web platform and sold to partners and customers. Through its subsidiary Deimos Imaging, UrtheCast processes and distributes imagery data and value-added products on behalf of the PanGeo Alliance, a network of eight satellite operators with a combined 15 medium- and high-resolution EO sensors. UrtheCast is also developing and expects to launch two EO satellite constellations: the world’s first fully-integrated constellation of sixteen multispectral optical and SAR satellites, called OptiSAR™, and an eight-satellite constellation designed to capture high-quality, medium-resolution optical imagery of the Earth’s entire landmass (excluding Antarctica) every day, called UrtheDaily™. Together, the Company believes these constellations will revolutionize monitoring of our planet with medium- and high-resolution, high-coverage and high-revisit imagery in all weather conditions. Common shares of UrtheCast trade on the Toronto Stock Exchange as ticker ‘UR’. This release contains certain information which, as presented, constitutes “forward-looking information” within the meaning of applicable Canadian securities laws. Forward-looking information involves statements that relate to future events and often addresses expected future business and financial performance, containing words such as “anticipate”, “believe”, “plan”, and “expect”, statements that an action or event “may”, “might”, “could” or “will” be taken or occur, or other similar expressions and includes, but is not limited to; its receipt of the funding contribution from SADI; its ability to comply with the covenants and other obligations under the funding contribution agreement with SADI (the “SADI Agreement”); its future growth and operations plans, and . Such statements reflect UrtheCast’s current views with respect to future events and are necessarily based upon a number of estimates and assumptions that, while considered reasonable by UrtheCast, are inherently subject to significant uncertainties and contingencies. Many factors could cause UrtheCast’s actual results, performance or achievements to be materially different from any future results, performance, or achievements that may be expressed or implied by such forward-looking statements, including, among others: failing to comply with any obligation of UrtheCast pursuant to the SADI Agreement; failing to maintain certain financial solvency and similar requirements and access to revolving credit facilities required pursuant to the SADI Agreement; any changes in the funding of the SADI program by the Government of Canada or a change in applicable laws that affects UrtheCast’s ability to obtain its funding under the SADI Agreement; any delays or failures in the design, development, construction, launch and operational commissioning of the proposed OptiSAR™ or UrtheDaily constellations; the Company being unable to convert the Memoranda of Understanding in respect of funding of the OptiSAR™ constellation into binding, definitive agreements; interruptions to or failures of UrtheCast’s infrastructure; legal and regulatory changes, as well as those factors and assumptions discussed in UrtheCast’s annual information form dated March 29, 2016, (the “AIF”), which is available under UrtheCast’s SEDAR profile at www.sedar.com. Forward-looking information is developed based on assumptions about such risks, uncertainties and other factors set out herein, in the AIF, and as disclosed from time to time on UrtheCast’s SEDAR profile. UrtheCast undertakes no obligation to update forward-looking statements except as required by Canadian securities laws. Readers are cautioned against attributing undue certainty to forward-looking statements.